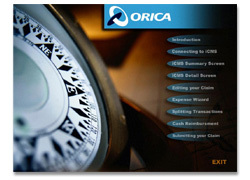 Orica Video/Interactive CD-ROM training tool. Produced for Orica iCMS products, this title allows users to quickly view any of the 10 video clips for specific training details. Copyright © 2000-2003 Media Tech. All rights reserved.